U.N. Secretary-General Antonio Guterres told the Security Council on Tuesday that he is pressing on with a bid to re-start negotiations on reuniting Cyprus, nearly two years after talks collapsed. "It is my hope that the ongoing consultations will lead to a return to negotiations, to which I could devote the full weight of my good offices, with the aim of reaching a lasting resolution of the Cyprus issue," Guterres said in the report laying out the improvement between Oct. 6, 2018 and April 10, 2019 on the Cyprus peace talks obtained by French Press Agency (AFP). 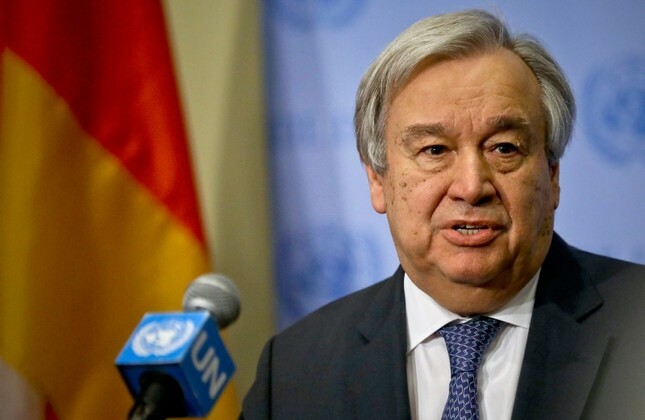 Guterres called on the Turkish Republic of Northern Cyprus (TRNC) and the Greek Cypriot administration, the guarantor powers, and other interested parties to engage in the peace efforts "constructively, creatively and with the necessary sense of urgency." He expressed his belief in reinitiating negotiations despite the unfruitful talks. The U.N. chief hailed two recent meetings between the leaders of the TRNC and the Greek Cypriot administration as a "rare opportunity." Commenting on political solutions based on bicommunal and equal political rights, Guterres emphasized that finding a permanent solution to the Cyprus problem is in the hands of the two leaders. "To reach a solution, both sides must accept less than their expectations on all issues. A comprehensive solution will create opportunities for growth, prosperity and trust, otherwise these will not happen," he said. Greek Cypriot leader Nicos Anastasiades and his Turkish Cypriot counterpart Mustafa Akıncı have met in October and February for face-to-face exchanges. Lute has traveled to Cyprus four times since October for talks on re-starting negotiations and has met with representatives from Greece, Turkey, the United Kingdom and with EU foreign policy chief Federica Mogherini. The Security Council in January asked Guterres to report on his efforts to re-start talks after renewing the mandate of the U.N. peacekeeping mission for six months. The United States has warned that without progress towards a political solution, U.N. peacekeepers will not remain indefinitely on the divided island. Cyprus has been divided since 1974 when a Greek Cypriot coup followed decades of violence against the island's Turks and Ankara's intervention as a guarantor power. Negotiations over Cyprus resumed after the 2004 U.N.-backed Annan Plan to reunify the Turkish Cypriot and Greek Cypriot communities, although talks have continuously stalled and resumed multiple times since they began. The most recent talks aimed at reunifying the island came to an impasse in Switzerland in July 2017. The U.N. in January asked Guterres to report on his efforts to restart talks, warning that without progress toward a political solution, U.N. peacekeepers will not remain indefinitely on the divided island. Turkey blames Greek Cypriot intransigence for the talks' failure and has been maintaining that it has always been willing to exert the necessary efforts in finding a solution to the decades-long Cyprus issue. Touching on an opinion poll conducted in the last months of 2018 that was coordinated by the U.N. and the World Bank, Guterres noted that communities on both sides of the island neither know what the peace plan is nor what the plan entails. According to the poll, both communities often express their wish for reconciliation and reunification; however, they share common concerns about repercussions of reunification on the economy, governance and society due to the long-standing status quo on the island. The poll stated steadfast uncertainty about the future of the peace process gives the impression that political engagement has deteriorated for people on both sides and damaged the belief of people in the process. The showdown and "statements like in a duel" between the TRNC and the Greek Cypriot administration undermine the reunification talks, the report added. The U.N. chief also hailed two recent meetings between the leaders of the TRNC and the Greek Cypriot administration as a "rare opportunity." Following the meeting of the two leaders, a number of confidence-building measures have been agreed on, including mine clearance, exchanging works of art between the two sides, electricity transfers and allowing mobile phone providers to operate on both sides. Still, "the skepticism on both sides regarding the prospects for a resumption of talks continued to prevail" following the leaders' private meetings, Guterres said. Turkish Cypriot leader Mustafa Akıncı and his Greek Cypriot counterpart Nicos Anastasiades met in October 2018 and February 2019 for face-to-face exchanges. Lute, on the other hand, has traveled to Cyprus four times since October for talks on restarting negotiations and has met with representatives from Greece, Turkey, the United Kingdom and with EU foreign policy chief Federica Mogherini.